Lori: Honey, look at these amazing beads I got today in the mail. Joe: Oh wow. Cool. Who made those? Lori: No one, they're stones! Joe: No way, those can't be stones. They look ceramic. Lori: Look at this other strand I got! Aren't they incredible? Joe: Who made those? Those definitely aren't stones. Lori: THEY ARE STONES!! Can you believe it!? Joe: They can't be stones. They look man-made. That's pretty amazing. My thoughts exactly. If I could marry a stone, it would be one of those handsome stones from the top photo. Just doesn't get any better than that!! Top stones are Noreena Jasper, the bottom stones are Utah Wonderstone. Wow great! the workmanship to create these usable pieces are impeccable, so go on spill wher did you get them? Wow, I've never seen anything like that before! They're beautiful!!!! And yes, I thought the first set was polymer. Imagine the "conditions" that they were formed in?! Thanks for the opportunity to win. This looks like a wonderful reference of your stones or product. The top ones really look like polymer clay mokume gane - beautiful colours as well! I'm drooling over the top beads! wow I can't wait to see what you make with them! I'm originally from Utah and the bottom stones are very familiar to me. My grandfather was a bit of a rock hound and he had a bolo tie made out of this stone, which I inherited after he died. I was told the stone is actually rhyolite, and the gray spots in it are hematite. Its only found in southern Utah. This brings back lots of fond memories for me. The beads in the first picture look like polymer clay and the second picture they look wood. Nice Finds! You will have to post what you make with them. Gorgeous and so unusual looking! Can't wait to see what you do with them! I cant wait to see what loveliness you create with these! 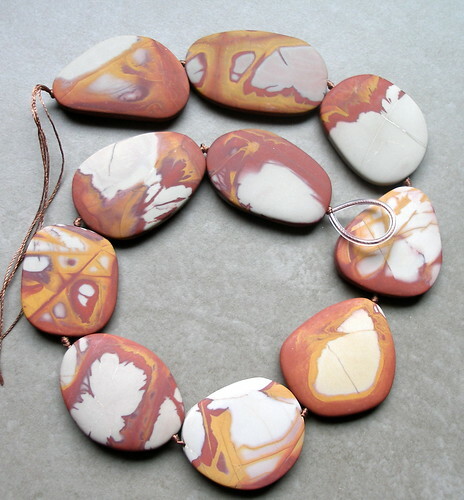 I love stones, I love Jasper, these are beauties, can't wait to see what you create with them. The top ones remind me of Humblebeads bead. Love the stones. They're awesome. Mother earth sure makes some great stuff. 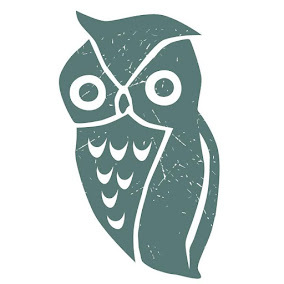 I also absolutely love your Sittin in a tree necklace in the shop. All the stones look great. 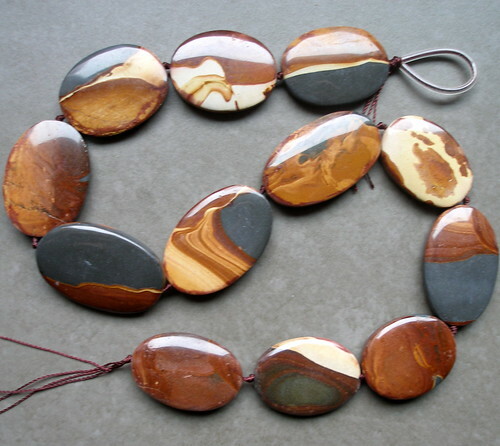 I like to wear a necklace made out of these beautiful stones. Can you help me in shopping Utah wonderstones ?